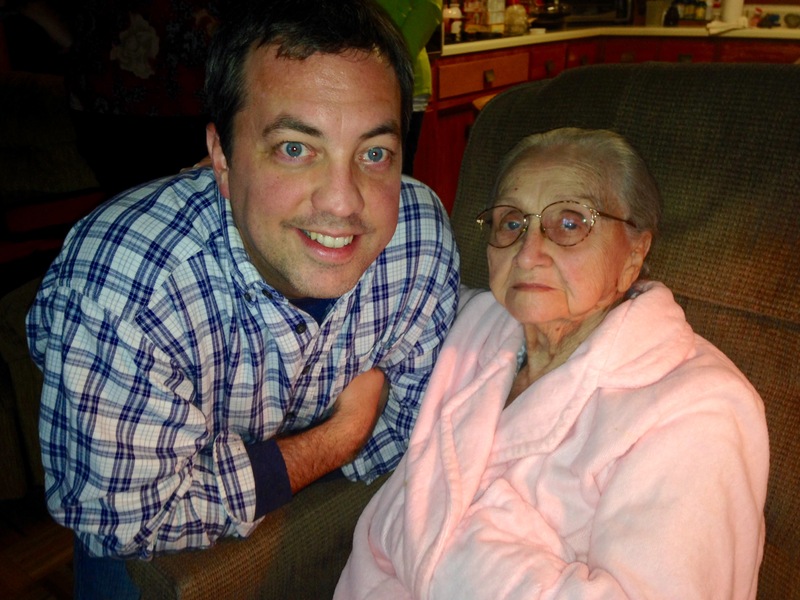 Yesterday I had the opportunity to spend some time with my grandmother, my last living grandparent. Her health is deteriorating so my sister and I have made it a point to visit with her twice in the last two weeks. No matter how much time we spend with this great woman, she always leaves us wanting more. And yesterday was no exception. As we spoke with her yesterday, her voice was a little weaker than it was the previous week. We had to sit closer in order for her to hear us. But her mind is still as sharp as ever. Last week, she handed me her old church song book and asked us to sing some of her favorite hymns. There were a few we didn’t know very well — I’m pretty sure I made up the tunes to a couple right there on the spot! — but it was a beautiful experience nonetheless. Yesterday, I picked up her weathered Bible from its place beside her favorite chair. The spine indicated years of wear and tear. As I leafed through dogeared pages yellowed with age, my aunt told me that Grandmother spent 45 minutes reading her Bible the previous day. If she’s not spending time with her family, her favorite way to spend her time is in the Word. If you’ve heard me preach or pray, you’ve probably heard me talk about how formative these words have been in my life. The final lines of this Psalm are the most repeated phrases in the Bible. Based on the sheer volume of occurrences, the central message of Scripture appears to be “Give thanks to the Lord, for He is good; His love endures forever.” These words are a well-worn path through the heart of God’s Word, words that communicate transformative truth. His love, an extension of His goodness, endures for all eternity. This is what I pray every day. This is the aim of my ministry, my personal mission statement to be a conduit of this love. I can’t overstate how important this truth has been in my life. As I shared all of this with my Grandmother, she just smiled and nodded her head. Then she told me her favorite part of the Psalm: “I love the last line about all generations.” This woman, the matriarch of our family in the twilight of her life in the flesh, spoke with pride about the joy of witnessing generation upon generation of her own line — all the weddings and births and holidays and celebrations. Six children, thirteen grandchildren, and more great-grandchildren than I can count…all branches of a family tree that began over 75 years ago when my grandparents married. Most importantly, this has been a family of faith where the name of Jesus has been exalted. Small wonder this part of the passage resonated with her. It’s her life’s story. In this season of gratitude and good news, I am thankful for my dear grandmother. She is truly an incarnation of Gospel in my life: bold yet gentle; loving yet uncompromising. Grandmother, throughout my life, your love has been constant and enduring, a brief glimpse into the heart of the Father’s love for us all. All of your generations are blessed by your faith, both in God and in each of us. You give us a reason to be hopeful, with a joyful song ready to burst into praise. Thank you for the way you’ve shepherded this flock all these years. May your deeds soon follow you. This entry was posted in Blessings, Faith, Family, Jesus, Scripture, Tara, Theology. Bookmark the permalink.